Spoto Family Wines is the first bonded winery in Sacramento (county), California that is owned and operated by the Spoto Family. 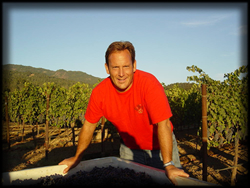 The vintner, Stuart Spoto, makes primarily Bordeaux-style blends with grapes from Oakville, the heart of the Napa Valley. Additionally, Spoto Wines crafts other varietals such as Chardonnay, Syrah and Pinot Noir to provide a wide range of pairings for a customized experience. Stuart's grandfather, Enrico Rodolfo Spoto, Sr., immigrated to the United States on December 1, 1913 from Catania, Sicily at the age of 15. He moved to Northern California, where he started a family and ran a fruit and nut tree nursery. His son, Henry Spoto, Jr., a first generation Italian-American, taught himself to make wine in Yuba City, California using the grapes they grew on their property. At the age of 16, Henry's son Stuart expressed an interest in the process. Henry, at the time a Cal-Trans appraiser, made wine only in his spare time. Over time, Henry began spending more time making wine and seeking advice from the experts at the University of California at Davis' Viticulture and Enology Department. As the years progressed, Henry and Stuart learned the techniques and chemistry necessary to make good wines. Stuart later attended the University of California at Davis and studied chemical and civil engineering. Stuart met his wife Christy while attending school at UC Davis and the two were married in 1983. Their wedding reception was in a vineyard. Winemaking became a hobby for both father and son, and in 2000, they began creating their own vintages. When out at dinner, the men would bring their wines to enjoy, and would always offer a glass to the sommelier. The sommelier would often ask where he could purchase the wines. Upon learning that the wines were not available on the market, they encouraged the men to become licensed. In 2004, Spoto Family Wines became the first bonded winery in a residential neighborhood in Sacramento County. This was not an easy task, and Christy and Stuart spent many months applying for licenses from the required departments. Today, due to the Spoto’s pioneering efforts, there are many bonded wineries in Sacramento County, allowing home wineries to sell their wines commercially. In 2010, Stuart took the wine business on full-time. 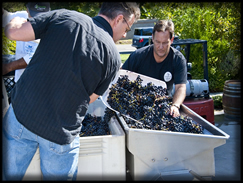 In November 2010, Spoto Family Wines was invited to be a member of the Oakville Wine Growers Association, which promotes the Oakville AVA (American Viticultural Area) as the premier Cabernet region in the United States. A year later, Spoto Family Wines was granted membership to the Napa Valley Vintners, an organization that promotes the wines from the Napa Valley. The whole family is involved with the winery. 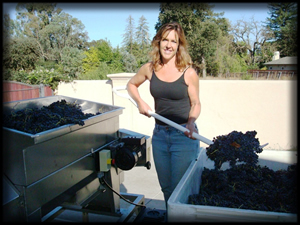 Stuart's wife Christy is an integral part of the day-to-day operations and production at the winery. Stuart's oldest daughter, Arianna, graduated in 2011 from California Polytechnic University at San Luis Obispo with a degree in wine and viticulture. She has worked in wine production and distribution all around the world. His youngest daughter, Alexi, graduated from the University of California at San Diego in 2013 with a degree in biochemistry, and manages the winery's public relations and social media accounts. Spoto Family Wines, an ultra-boutique winery, produces less than 500 cases of premier wines from the Napa Valley. It is exclusively run by three generations of Spotos. Spoto Family Wines may be found at many high-end restaurants and wine shops primarily in California, but the wines are also available on a national platform. Please see our “Where to Find” page for more details. 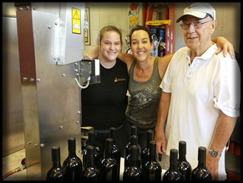 Three generations of Spoto's bottling our 2011 Enrico. Local restauranteur Matt Woolston helping with the Crush. Alexi working on the 2009 Cuvée Alexi blend. Christy working on the Crush. Ari helping in the vineyard. The Spoto Family has been hand-crafting wines for over 30 years. Stuart Spoto, a 2nd generation wine maker, learned how to make wine from his father, Henry Spoto Jr., who was featured in Wine Spectator Magazine for his award-winning wines. This family collaboration has greatly influenced Stuart to create his ultra-boutique winery and to perfect his Oakville Cabernets and Bordeaux-style blends. Stuart’s received his degree from the University of California at Davis in Chemical & Civil Engineering. He has also acquired an extensive knowledge in the art of winemaking by working closely with the Department of Viticulture and Enology at UC Davis. Stuart’s entire family is involved in the winery. Christy, his wife of 30+ years, assists in every aspect of winemaking from bottling to marketing. She manages the wine club, as well as coordinates all social events. 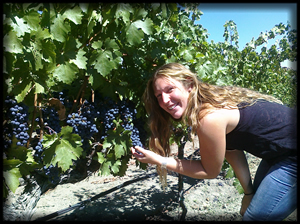 Ari, Stuart’s eldest daughter, got her degree in Wine & Viticulture from Cal Poly San Luis Obispo and assists with the wine making at Spoto Family Wines when she is not traveling the world making wine in Australia, Argentina, South Africa and beyond. Alexi, Stuart's youngest daughter, challenges Stuart technically (due to her recent degree in Biochemistry from UC San Diego) while currently handling all the social media and newsletter communications. 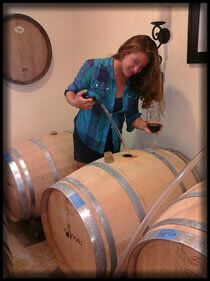 She provides information on wine offerings and sends updates on all the events that are taking place at the winery. Even Stuart’s parents, who are in their 80’s, assist whenever possible with everything from production to blending. Spoto Family Wines is a family business dedicated to producing the finest small-production, high quality Oakville wines.